If you ask tech savvy users for CD burning software recommendations they usually propose Nero Burning Rom as the commercial software to pick, but chance is that they will list five to ten free CD burning software programs. Not all of the free alternatives to Nero provide all the features that Nero comes with, but most do a very fine job when it comes to basic CD, DVD and Blu-Ray burning tasks. But money is not the only issue for most users. Nero has become bloated over time with lots of additional burning tools that most users do not need. The free CD burning alternatives are usually lightweight and tend to concentrate on the popular operations that most users do when burning CDs. The review could probably end here as ImgBurn is a complete CD burning software. It supports a wide variety of disk images, most Microsoft operating systems, video CDs, DVDs, HD DVD and Blu-Ray disks as well as audio CDs. The only drawback is that its usage can be complicated at the beginning. The developers are however offering guides on their website (linked from the burning software) which guide the user in completing specific tasks. Supported disk formats: BIN, CUE, DI, DVD, GI, IMG, ISO, MDS, NRG and PDI. ImgBurn is a lightweight software that offers CD burning operations for the majority of users out there. It offers a wizard and manual CD burning mode. 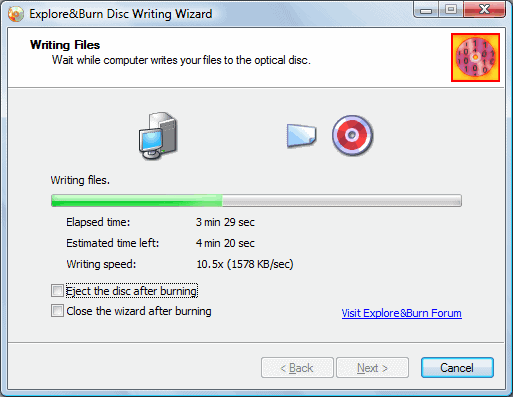 CDBurner XP is another popular CD burning software. It supports the same amount of disk types that ImgBurn supports including various types of CD and DVD disks but also HD-DVD and Blu-Ray disks. Usage is a little bit easier than that of ImgBurn but the limited amount of supported disk image formats makes it unusable for some users who need to work with those formats. Supported disk formats: ISO but can also convert nrg and bin to ISO. InfraRecorder is an Open Source CD burning software that is provided as a portable version and an installer. The interface is similar to that of CDBurner XP with its two pane explorer like interface. The free CD burning software has limited disk format support and does not offer the means to burn HD or Blu-Ray videos. The burning software comes with Windows Explorer integration from where the burning operations are started. This makes the program comfortable to use but it also means that several features are missing from the program. This is a free version of a commercial software from Ashampoo. It offers a solid functionality and support for a limited number of disk image formats. Video: Create Video CDs and Video DVDs, burn CD, DVD and Blu-Ray video disks. BurnAware Free is a burning software for Windows that is offered as a free, limited version, and two commercial versions. The free version supports all common disc related activities though including the creation of data, audio and multimedia discs. Audio CDs: Yes, creation of mp3 discs. other features: Burn across multiple discs. ImgBurn is the free CD burning software with the largest support of different disk image formats and audio formats making it an ideal solution for users who want the greatest compatibility. Are you using one of those CD burning programs that are reviewed in this post? Or are you using another program that has not been included but should be? Let us know in the comments. 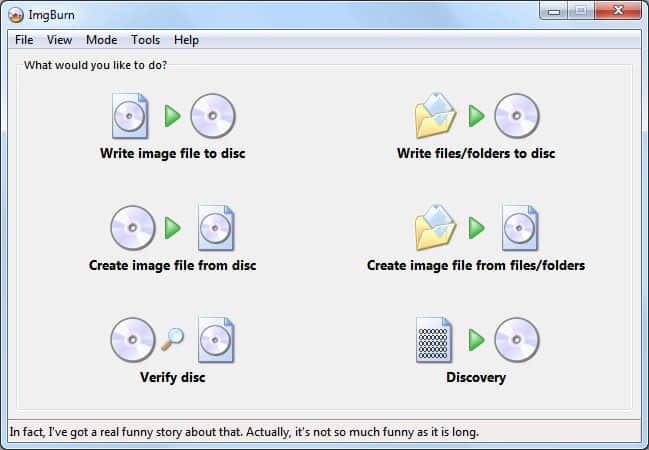 The free CD burning software article lists free programs for Windows that you can use to burn data, audio, and video content to discs. I use imgburn. Great piece of software. I currently use or have used the products listed except Explore & Burn. While Imgburn has the most options, I believe that Ashampoo is better for the casual user. More straight forward & easier to use. I have used ImgBurn for a couple of years and believe the feature set is second to none. I do however have reservations about the interface, even after using it for so long I’m still not completely comfortable with it. yes I do know how to use it but still I find it intimidating, I would would personally prefer an interface that looks like nero\CDBurnerXP. To give you an example, most people including myself have to read a tutorial before burning an audio CD with it, an everyday feature like this should be intuitive. Why didn’t you mention UsefulUtils Discs Studio 3.0.2? You have already wrote about it before. nero has free version, and you can download it in their site. Nero Free its crap, everyone knows that. IMGBurn its one of the best soft in optical burning. I use DVD Flick, which incorporates ImgBurn, which in turn performs well. It does not do CDs, however.For CDs I use Ashampoo; it is simple & easy for music. Meets my needs. When I used Vista 32bit I was a big fan of InfraRecorder. After I upgraded to Windows 7 64bit InfraRecorder no longer worked and would crash just before the burn process started. Their web site also doesn’t appear to be updated all that often which lead me to believe (possibly mistakenly) that development had ceased on the project. Thanks for posting this article as I have been looking for other free alternatives now that I have upgraded to Win7. Hopefully ImgBurn supports crossfading audio tracks (or making gapless audio tracks). That was my favorite feature of using Nero to burn Audio CDs. Some applications must see Nero installed on your system in order to burn otherwise they will fail. ISO Recorder is kind of spartan but I have used V2 to burn .iso images successfully from a Windows XP installation.